Mobster Mayhem delivers a fun new gaming experience using strategy, imaginative buildings and a superb lineup of characters - Shorty, Molotov Man, Norman Knuckles and Chopper Charlie to name a few! 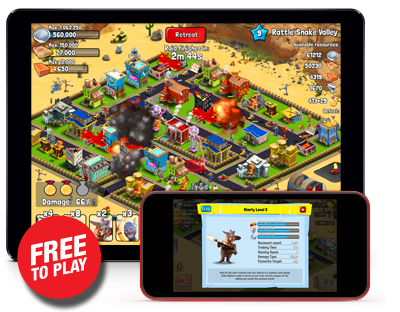 Rustle up a Mob, raid towns and use your ill gotten gains to further develop your town. And let's not forget Prospector Pete. There's gold in them there hills, but how much will you be willing to gamble on him striking it rich? So what are you waiting for? Be the boss that everyone fears, and respects! Mugla Kitty has just stepped into the world of iOS Apps with its first game - Mobster Mayhem. A project that has taken two years to develop. We are a VERY small team consisting of one app developer, two designers, two 3D animators and one website developer. So you can imagine how extremely proud and excited we are of what we have created. We will continue to nurture and develop Mobster Mayhem into an even better gaming experience. Mugla Kitty doesn't intend to stay put either because we have other projects in the pipeline. With your help, by playing Mobster Mayhem for free and spreading the word through our social channels, we can realise our plans, offering you more in return - for free. And just in case you were wandering what Mugla Kitty means, here you go: A fictitious being, that is often revealed during intense situations, such as playing video games. Gamers assume the Mugla Kitty when raising their arms and flailing their hands in front of their face. Strange sounds have been known to be emitted from the Mugla at the same time.